Following graduation from law school, Ms. Holdiman-Miller worked for the United States District Court for the Northern District of Iowa. 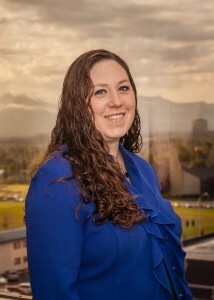 She relocated to Alaska in 2005 to be near family, and joined the law offices of Holmes Weddle & Barcott in 2005. Prior to law school, Ms. Holdiman-Miller performed an externship at the Office of the Corporation Counsel in Washington, D.C., in the child abuse and neglect division. During law school, Ms. Holdiman-Miller worked for Iowa Legal Aid (formally “Legal Services Corporation of Iowa”), which provides legal services to low income Iowans. Ms. Holdiman-Miller practices in the firm’s Anchorage office, providing representation in workers’ compensation defense, insurance defense, and general civil litigation. Ms. Holdiman-Miller has been selected by the Commissioner of Labor and Workforce Development in 2013, 2013, and 2014 to sit on the panel to select physicians for inclusion on the Board's list of physicians.